Have you been reading through the reviews in your search for a new blender, but have not been able to find the right one? You probably want a model that is big, powerful, and can do it all, but you’re not quite sure and are not ready to make that final decision. We are here to take a look at the Vitamix G Series 780, hopefully, a model which will tick all the boxes for you. It is sleek and modern with a low profile 64 oz. container to fit under most cabinets. Touch screen control panel with 5 easy programs and 10 variable speed settings and pulse features. The touch screen controls are self-explanatory and easy to use. It has a high quality metal drive system, stainless steel blades and a long warranty as you'd expect from Vitamix. Overall a very impressive blender that can do anything you'd want from making smoothies, nut butters, frozen desserts and hot soups, but at a price! This is a fairly expensive and very high-quality blender. This is a blender that you would buy if you will be blending things on a daily basis. Since it can make soups, smoothies, frozen desserts, and everything in between, it is a very versatile and useful blender. Yes, the Vitamix G Series 780 does cost a lot, but it is meant for people who need a blender for regular use and need to make large batches too. The Vitamix G Series 780 will definitely get the job done no matter what. When you buy the Vitamix G Series 780, you of course get the blender itself, which is a 1440-watt blender, or in other words, quite powerful. It also comes with specially engineered stainless steel cutting and hammermill blades for awesome function. The wide blending radius here is a pretty big deal no doubt. What is also nice is that the Vitamix G Series 780 comes with an introductory cookbook full of recipes that can be made. The warranty that comes with it is pretty fantastic. In terms of the features, the Vitamix G Series 780 comes with quite a few of them. First off, you get a total of 5 pre-programmed settings. This is convenient because it means that this blender can make a whole lot of different foods with ease. It has a special setting for pretty much everything. It can grind nuts into butters, it can make creamy smoothies, it can be used to make frozen desserts, hot soups, and much more. What is impressive is that this item can handle hot liquids, ice cubes, dry goods, and pretty much everything in between, something where other blenders fall short. The Vitamix G Series 780 also comes with 10 different speed settings that can be used as you see fit. It also comes with a pulse function for those times when pulsing foods is more than enough. What is really cool here is that this blender is also self-cleaning. All you have to do is put some soap and hot water in it, turn it on its highest speed, and leave it for about 1 minute. After this is done and rinsed, the blender should be squeaky clean once again. 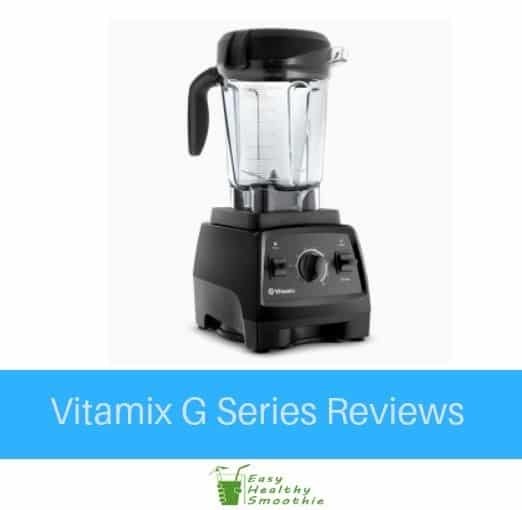 The Vitamix G Series 780 comes with a strong 1440 watt motor, which is more than strong enough to mash its way through pretty much any kind of item you might want to put in it. On that same note, the high quality hammermill and cutting blades are designed to last for a very long time. They are both super sharp and very durable, the latter of which can be said for the blender in general. This thing is quite tough, as it should be considering how much money it costs. We also like how the Vitamix G Series 780 has a 64-oz. container, yet features a fairly low profile. While it does take up a good amount of space, and also weighs a fair amount, at least its low profile makes it easy to store in a smaller kitchen cupboard. It does have an LCD touchscreen, which is pretty cool, we do have to say. At the end of the day, we really like the Vitamix G Series 780. Yes, it might be bit expensive, but it is indeed one of the best blenders out there at the moment. It has a ton of different settings, can handle a large variety of ingredients, it can make large batches, and it is very powerful. It might be a bit heavy, but that’s not a big deal as far as we are concerned.